Thanks to +Francisco Javier Delgado del Hoyo for adding global menus. gsettings set org.pantheon.desktop.wingpanel blacklist ""
Thanks to +Sergiy Kusch for providing code to add/remove window controls without requiring maximus installed. There have been some changes recently. I’ve removed most of the latest features from the stable version of wingpanel because they were causing issues for a number of people. If you want the latest features (such as global menu) you’ll need to add the daily ppa with the command at the top of this post. I just installed the latest daily-ppa version of super-wingpanel, which is awesome btw(! ), with Global Menu addition. Changed the dconf and Cerbere setting, logged out and in again, but the Global Menu is still on the right (so wrong for me 😉 ) side. If you still have both the stable and the unstable PPAs added, the software updater will pull from whichever PPA has the highest version number. Currently I believe the stable PPA has a higher number so you’ll need to remove the stable PPA, then uninstall and re-install super-wingpanel. 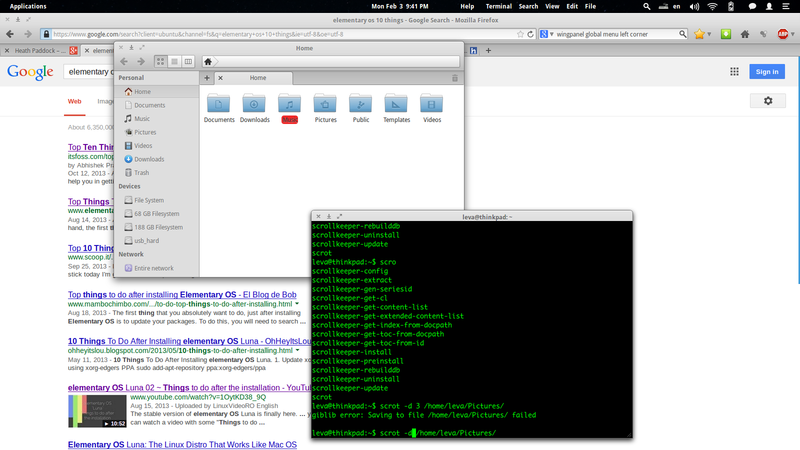 elementary OS, wingpanel and I have all moved on. They have added a lot of great new features and it would require a significant amount of work to bring super-wingpanel back from the dead. You would probably be better off starting from scratch. If you’re looking for customization from your DE, elementary OS should not be your first choice. That said, they do build a beautiful desktop. I come from http://ubuntuhandbook.org/index.php/2014/01/global-menu-elementaryos-luna/ where someone posted and linked your work. Super-wingpanel was working fine but after an update/reboot it stopped working properly and started ignoring some of the dconf entries (like indicator order, clock placement) and globalmenu appears backwards (help, tools–>file). I’m not the only one with this issue, as some other people in the post I linked before get the same errors. First of all, thanks for your good work. Just to let you know that your global menu bar was working correctly after installation but now I have an inversed menu on the right of the clock. An other question, how do you to use an Images/Styling for the Applications button? I downloaded your nice icons but I don’t know how to apply them. There have been some changes recently. I’ve removed most of the latest features from the stable version of wingpanel because they were causing issues for a number of people. If you want the latest features (such as global menu) you’ll need to add the unstable ppa with the command at the top of this post. Thanks for that! 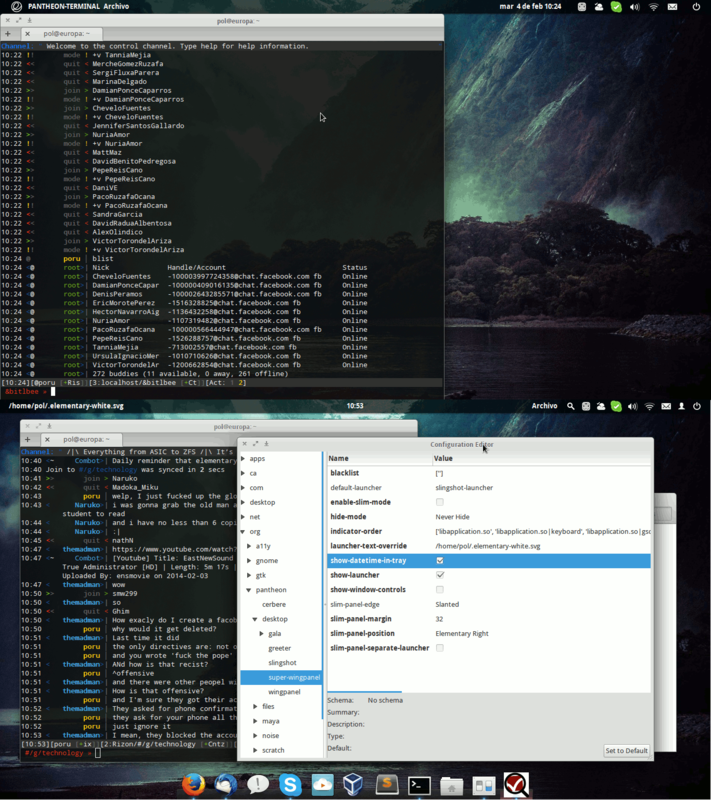 Anyway, is it possible to remove the app name in the left corner (like PANTHEON-TERMINAL/…)? The problem is then when using Ninja or other IDE, it displays not only “NINJA-IDE” but also the whole path to the file that is being edited in Ninja. In other words, the panel gets populated by file name and the whole menu is unusable. Checkbox “Show app name in wingpanel” would solve this. No, it is not currently an option to remove the name of the application. Can’t help but notice how people ignore the blog post itself. It already says there that you need to add the unstable repo. Anyway, I just wanted to ask how to use those svg images? I read the pango markup format but it didn’t told me how to put images. If you want to use an image, just put the full path to the image file in the Launcher Text Override box. In the latest versions (both stable and unstable) it should automatically show the image if the path is valid. In older versions you may have to restart the panel for the image to appear. Can you add builds for trusty to your daily PPA? I share my questions back on google+ yesterday. in order to give a distinctive note in the comments of this blog. how to cope with the global distance application menu button menu with frequently changing away? Thank you. Is there any way of speeding up the animation of Intellislim and Intellihide? Now it feels out of sync with the rest of elementary and plank especially (slower). In general I have animations set to about 100-150 ms. Would like super-wingpanel to do things around 100ms as well! Otherwise awesome stuff, good job! can you/will you add an option to Merge the menu bar and the title bar with the global menu, as it happens in ubuntu/unity? How can i revert changes? Please :/ it doesn’t work as I expected. Hello is there a way I can contribute in some way to remove the annoying app name in the global menus?, there must be a way man. How can I change the font weight in global menu? I was a big fan of super-wingpanel back in the Luna days! Any chance it will be revived for Loki? Would be wonderful!